How could you look at this spider and not think it’s cute? Unfortunately, many people will look at this photo and recoil. I’ve gotten so used to handling and admiring spiders and other invertebrates that I forget most of the human population is much less comfortable with them. I wish I could help; spiders (and other “creepy” invertebrates) are incredibly important, but it’s hard to have a conservation discussion about them when the person you’re talking to is covering their face in disgust and fear. I get that many people have a very strong visceral reaction to spiders (and/or snakes), and I’m not trying to minimize or mock that. In fact, I can relate. My own initial reaction to seeing a snake in the wild is usually to take a quick step backward. However, I’ve spent enough time getting comfortable with snakes that after that first backward step, my next move is usually to try to catch them to get a better look. Experience helped me conquer my discomfort and turn it into admiration. I think the same would help most people deal with snakes, spiders and others, but getting the majority of the public that kind of direct exposure and experience seems unlikely. Here’s a compromise. We don’t need everyone in the world to love spiders and snakes to the point where they try to cuddle every one they find. Instead, it’d be great if people could just understand that spiders and snakes are critically important components of complex ecological systems rather than nasty creatures to stomp on or chop with shovels. I don’t expect anyone to transform from spider hater to spider cuddler just because I say spiders are cute and ecologically valuable. However, maybe I can nudge the ball in the right direction by pointing out some mythology about the danger of spiders. Let’s start with this: Almost no one reading this blog post will ever encounter a spider that will pose any danger to their health. Seriously. The vast majority of spiders can’t even bite you – their little fangs can’t penetrate your skin. With very few exceptions reported “spider bites” turn out to be something else. SPIDERS DON’T WANT TO HURT YOU. I’ve handled countless spiders of many many varieties and have never had one act aggressively toward me, let alone try to bite me. I’m not going to tell you there are no dangerous spiders. There are a few species that can cause you harm, but the chances of running into one of them are pretty slim, especially in Nebraska and most other midwestern U.S states. Really slim. And if you do happen to encounter one, they’re not going to jump up and bite you on the throat. I promise. Also, they are not going to lay their eggs inside you so that your face (or other body part) swells up until it eventually bursts and thousands of tiny spiders come out. Not going to happen. That’s a particularly vivid, but completely false urban legend. Spiders are just tiny creatures trying to survive in a dangerous world. Just like you, though possibly cuter – I don’t know, I haven’t met all of you. Maybe you don’t want to pick spiders up and play with them. That’s cool. But maybe you don’t have to kill every spider you see because you figure it’s either them or you. It’s not. They’re just trying to find something to eat and avoid being eaten themselves. Ignore them. Or catch them in a cup and take them to a safe place. Or, if you’re feeling really crazy, pick them up, put them on a wood chip and take pictures of their adorable little faces. 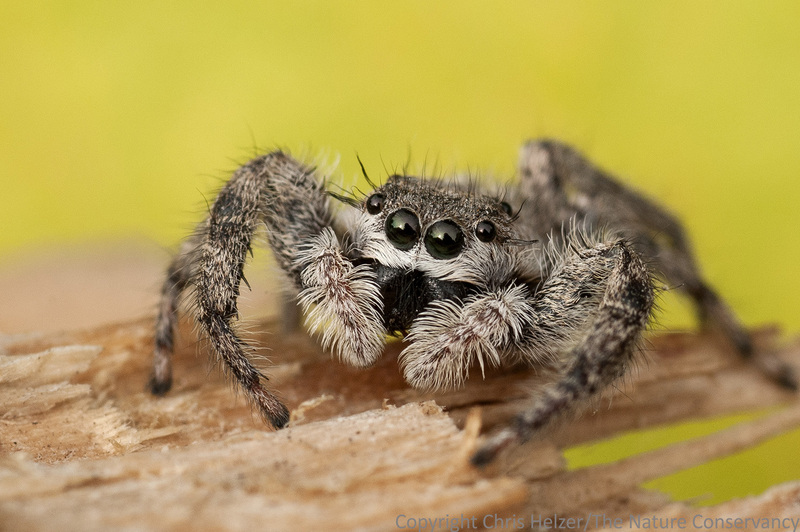 This entry was posted in Prairie Insects, Prairie Natural History, Prairie Photography and tagged jumping spider, mythology, safety, spider, spider bite, spiders are dangerous, spiders are safe, spiders don't bite people, urban legend by Chris Helzer. Bookmark the permalink. I have been organizing ‘bug hunts’ for kids to catch and look at insects and spiders and such, and the kids enthusiasm plus some hints on handling, and a bit of encouragement from me get them to looking at spiders and bugs differently. I do this mostly with families, so even parents get a bit more comfortable with these critters. Joel – good for you! That’s exactly what we need. Get as many as you can, and we’ll try other strategies with the rest. Thanks for doing it. The link below is to an article about brown recluse spiders in a few Kansas homes – one home had over 2,000 of them yet no one was bitten. This little guy is adorable! I particularly like jumping spiders and like having them around. While I do not like big spiders in my house, my husband carefully removes them and puts them outside. No squishing spiders around us! Thanks for the great photo! Hi Chris love your blog. Wondering what your favorite lens is for shooting insects? Chris, because of your spider posts, I no longer freak out when one comes my way (for the most part). I even handled some crab spiders and explained their cryptic coloration to a NCCC crew we had earlier this summer. However, the wolf spider I discovered sharing the shower with me yesterday went a little beyond my comfort zone. No harm was done, but it was one of the quickest showers I’ve ever taken! Great shot of the cute little guy! I was bit by a brown recluse. It got trapped between my backpack shoulder strap and my trapezius muscle. I ended up with a quarter size lesion that ate into the muscle tissue about 3/16” deep. I still have a nice white scar today. I did not feel the bite, but had a very hard time backpacking that day. I guess I am in the small minority with respect to spider bites. Insects in general have been my biggest menace. I also got a co-infection of Lyme disease and annaplasmosis. I never found or saw a tick as it is standard practice for me to check regularly. But apparently I must have missed one. I have been on a lot of outdoor adventures through the years and have been exposed to a lot of critters big and small. It is the really little guys that get you in the end. Oh yeah, I almost forgot I got giardia too. No hard feelings though. Just part of the outdoor experience and the odds are really low that you will ever have a problem. Yes, I have had a few very unpleasant experiences, but just think of the billions of encounters I have had that never caused a problem! I have a spider in my kitchen, behind a small potted plant and my radio. He’s a small funnel spider. One day I was having trouble with ants so I started picking them up and throwing them at the web. The spider came running out and captured the fly. I did this several times. I need to capture it on film. Still in his funnel, but I’m not sure how many ants there are. I may take it outside where feasting will be more productive. I love garden spiders. They are beautiful and make the most wonderful webs. Awesome photo! I love spiders and find then fascinating! That gal is so cute! When my husband was in the Air Force in Florida years ago, he and his bunkmates in the barracks were great “housekeepers,” but they let the spiders live in the corners ’cause they caught the other nasty arthropods. I like spiders, so I’m particularly frustrated every time an acquaintance is bitten by something, goes to the doctor with a modest-sized bite, and learns that it was a SPIDER bite! I know from experience that there are a lot of other little creatures out there that bite. I’m kind of surprised that some entomologist hasn’t written a Field Guide to Bug Bites. I’m one of those people that gets bitten (not stung) often, but I rarely see the culprit. I do know that there is enormous diversity in the nature of the bites. If there are any doctors or others out there who treat patients with “bites,” please, please refrain from announcing it’s a (horror of horrors): SPIDER BITE — just call it a “bug bite,” and let it go at that. We’ve got to stop killing the good guys.